The standard way of protecting buildings (and their occupants) from lightning is pretty simple: You stick a lightning rod on the roof, and then some kind of conducting channel that takes the huge discharge of electricity and dumps it into the ground. This is a tried and tested method that is used by most of the world’s tall buildings. In the case of something vital like lightning protection, I’m usually a firm believer in “if it ain’t broke, don’t fix it” but that was before I read about a new lightning protection system that uses lasers to redirect the lightning, so that it ignores the building entirely, instead taking a totally new route to ground or perhaps into a futuristic energy harvesting device. The typical bolt of lightning carries around 5 billion joules (GJ, gigajoules) of energy, or the energy stored in 145 liters of gasoline. For comparison, a ton of TNT is around 4 gigajoules so, we’re talking about quite a lot of energy here, concentrated in a very short period of time. Despite lightning protection systems, these strikes still cause around $1 billion in structural damage annually in the US so there’s obviously space for improvement. Enter lasers. According to researchers at the University of Arizona and University of Central Florida, high-power lasers can be used to redirect the flow of lightning. As a general rule, lightning follows the path of least resistance (impedance) to the ground. A big metal rod, with wires running into the ground, has much lower resistance than air (which has very high electrical resistance) and so the lightning chooses the rod. High-power lasers also don’t like to travel through air but, when they do, they strip away electrons, leaving a wake of highly conductive ionized plasma. Lightning frickin’ loves travelling through plasma. Externally refuelled optical filaments.The top image is high-power laser on its own; the bottom image is with the addition of a dressing beam. The problem, though, is that lasers simply can’t travel very far through air without defocusing (a problem known as blooming, which we cover in our feature story about the science of beam weapons). To create a long enough channel of plasma from the ground to the top of a building the researchers had to devise a new method of beaming high-power lasers through air. The technical name of this method is called “externally refuelled optical filaments” [doi:10.1038/nphoton.2014.47], but in short they embed the high-powered beam (the filament) inside a low-power “dressing beam.” As the filament loses power, the dressing beam refuels it. ”Think of two airplanes flying together, a small fighter jet accompanied by a large tanker,” says Maik Scheller, a University of Arizona researcher. All told, this technique allows the plasma column to be extended by “at least an order of magnitude.” In the lab, they increased the length of the plasma column from 10 inches to seven feet in the real world, they think they could get to 165 feet. 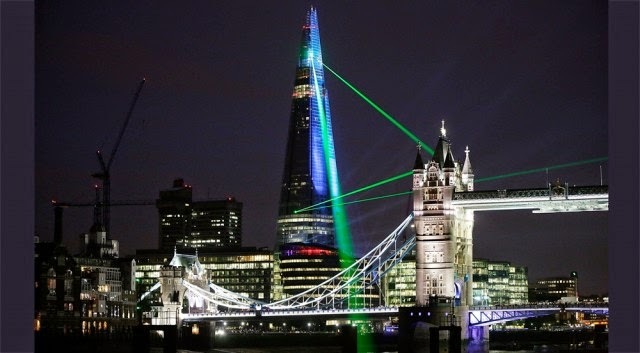 The idea is that, instead of sticking a lightning rod on top of the building, you would instead use a laser to produce a high-conductivity plasma channel. The researchers haven’t got as far as working out what a real-world installation would actually look like, but they seem positive that there are real, exciting applications for these refuelled optical filaments. If lightning really likes these plasma channels, there might also be a possibility of using them to guide the lightning towards some kind of energy harvesting apparatus. 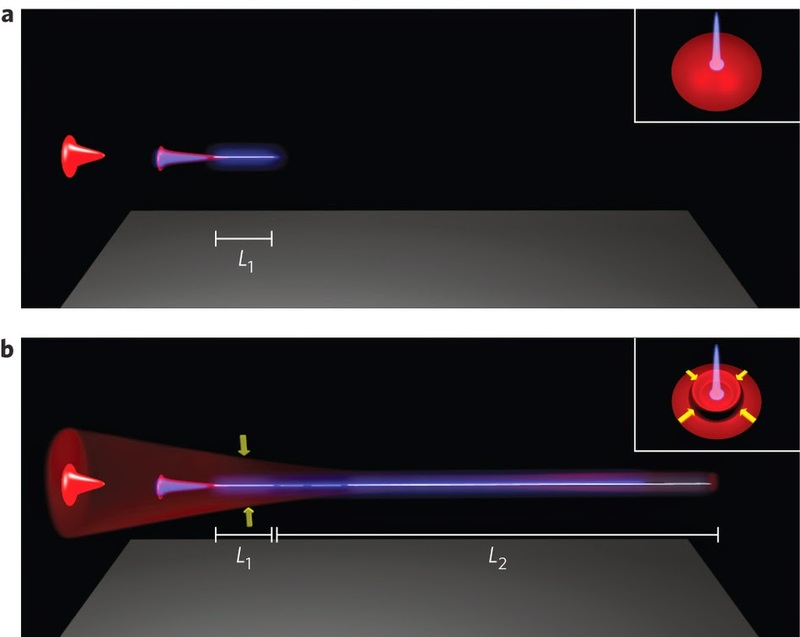 As an aside, while researching this story I came across the electrolaser a wondrously creative weapon that uses a laser to create a plasma column in air, and then uses that plasma channel to deliver a very strong electrical current. It is basically a long distance taser.